Last season, Yannick Nézet-Séguin’s debut at the Met conducting Bizet’s Carmen was a huge success. Critics praised the production, the acting and singing of Elīna Garanča in the title role, as well as the exciting conducting. This Carmen also became one of the hits of the season in the “Live at the Met in HD” series in movie theatres. And that wasn’t the end of it; Deutsche Grammophon recently released the DVD version – essentially the same HD broadcast – and more rave reviews are expected. Not surprisingly, on the strength of his Carmen triumph, Nézet-Séguin was invited back for an encore, arguably to an even greater achievement! The production of Verdi’s Don Carlo in the “Live at the Met in HD” series, which I saw recently in Austin, Texas was glorious in nearly every respect – at least musically. The principal members of the cast - Roberto Alagna, Marina Poplavskaya, Ferruccio Furlanetto, Simon Keenlyside and Anna Smirnova - gave unforgettable performances. Without a conductor who understands singers and drama, however, this wonderful but long and uneven opera can be tedious, to say the least. Nézet-Séguin unleashed the full power of the Met orchestra when necessary, but he was also sensitive to the quiet moments, and brought great freedom to the phrasing in the score without distorting the line or impeding the drama. Director Nicholas Hytner, the head of Britain’s National Theatre, who was making his Met debut with this production, appeared initially to be erring on the side of the "safe" and "traditional" until, in several problematic scenes, it became apparent that he was clearly out of his comfort zone with opera; for example, he gave us singers delivering difficult vocal passages from horizontal positions – a feat not only tough on the performers but also visually ridiculous! Most opera buffs know that there are several versions of Don Carlo. It began as a five-act opera in French (1867). By 1884, after Verdi had tried out various revisions, it had morphed into a four-act Italian opera. This new Met production was essentially the later Italian version with, as is often the case today, the "Fontainebleau" scene retained from the 1867 version; in other words, a five-act Italian opera with a running time (including two intermissions) of nearly five hours. Its inordinate length notwithstanding, Don Carlo contains some of Verdi’s greatest music. King Philip’s soliloquy and the scene between Philip and the Grand Inquisitor (Act 4 Pt. 1) are musically highly original and dramatically powerful. As a former double bass player, I am always attuned to what composers do with “my” instrument. Verdi often used the double bass for special effects, most notably in the last act of Otello. In Don Carlo, the duet between Philip and the Grand Inquisitor – a duet between two bass voices, by the way - has music that is dark and menacing and Verdi has created a unique sound that is difficult even for professional musicians to analyze by ear. The slithery, slow-moving “tune” is played by basses, cellos, bassoons and contrabassoons. But there is a catch. While most eighteenth and nineteenth century composers assign basses and cellos the same notes - their parts usually look exactly the same on paper - musicians know that the double basses (this is why they are called double basses) are actually playing an octave below the cellos. Because he wanted a special sound in this scene - the duet between Philip and the Grand Inquisitor - Verdi wrote the double bass part “up” an octave, which means that in this passage the basses and the cellos are playing the same notes at the same pitch, thereby producing a sound different from that which we normally hear from the combination of basses and cellos in a symphony orchestra. The other instruments in this passage are three trombones playing chords, timpani and bass drum. This sensitivity to instrumental timbres is typical of the later Verdi scores. He had come a long way from the incessant “oom-pah-pah” of his early operas. The words Verdi set to music, however, are not always up to the same standard. Don Carlo abounds in blatantly risible dialogue and baffling episodes. For example, in the last scene of the opera an Old Friar (Il Frate) appears from inside the tomb of the long dead Charles V (Carlo Quinto), who reveals himself to be none other than Charles V himself or his ghost, and all the characters in the scene immediately recognize him as such. In Verdi’s opera, the Old Friar/Charles V saves young Don Carlo by taking him into the tomb, whereas in Schiller’s play, on which the opera is based, Don Carlo is captured and handed over to the Inquisition. In Nicholas Hytner’s Met production, Don Carlo is killed by the soldiers who have come to arrest him. 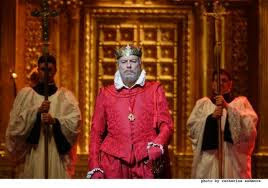 Verdi introduces Charles V in the last scene for the sole purpose of saving his grandson Don Carlos from certain death. Hytner changes Verdi’s ending by having Don Carlo die instead of being saved by Charles V. Why then is Charles V needed in this scene? Certainly many are baffled by this apparently gratuitous supernatural element Verdi tacked on to the end of the opera. Once Hytner decided to change it (to make it more plausible? More realistic? ), why did he not at least go all the way and make everything consistent? The Old Friar had appeared briefly earlier in the opera as a sort of keeper of the tomb, and in the final scene in this production he returns looking exactly the way he appeared earlier, that is, as an Old Friar. It is a laughable moment indeed to have all the characters point to him and shout “It’s Charles V!” or ‘My father!” etc. as if they have all lost their minds. Hytner should either have dressed the Old Friar like Charles V and had him rescue Don Carlo as Verdi and his librettists had intended, or let Don Carlo be killed by his tormentors and let the Old Friar take the rest of the night off. Instead, Hytner jumbled everything together and made a directorial shambles of a great opera. I had serious doubts about Hytner as early as the opening scene, in which we had Elisabeth de Valois wandering around the Fontainebleau Forest in the depths of winter in a skimpy dress while everyone in her entourage was bundled up in fur coats and hats. While I am on the subject of what works and what doesn’t, there is also the infamous auto-da-fé scene in which heretics are publically burned at the stake. It is a tasteless scene by any standard, rendered even more unpalatable by Verdi’s music, much of which could have been used in the triumphal scene in Aïda. The music is grand but without the qualities of horror and cruelty required by the drama; nonetheless, this is a scene that would benefit enormously from the attention of a director versed in contemporary theatrical realism. Hytner gave us pretty much what we always see, which is bits of processions to nowhere, and lots of highly-stylized writhing of prisoners accompanied by not very menacing guards and priests. In addition to the outstanding work of Nézet-Séguin – as a proud Canadian I am admittedly somewhat biased – this production features one of the signature portrayals on the operatic stage today, Ferruccio Furlanetto as King Philip. Furlanetto has been singing the role for more than 25 years and every time out he seems to get better. He was remarkable in Karajan’s Salzburg production in 1986 (preserved on a Sony DVD) and today at the age of 61, both vocally and dramatically, he is astonishing. His power and authority is frightening in his early scenes and in his soliloquoy he reveals at last his human side. In the scene with the Grand Inquisitor – Eric Halfvarson making this horrible creature even more hideous than usual – he asserts his terrible authority as best he can, but knows he cannot take on the Catholic church. Furlanetto gave us that rarity in grand opera, a complete character. Russian soprano Marina Poplavskaya also made a strong impression in this performance as Elisabetta. Her voice is not large and her demeanor can seem cold and inexpressive, but the beauty of her voice and her control of phrasing is remarkable. Robert Alagna as Don Carlo was also in great form. His voice had both strength and beauty and he was quite convincing as both an idealist and a man of action. Simon Keenlyside as Rodrigo cut a handsome figure and sang with assurance.